Love these gold plated sandals, I just got something similar to them! Sooo jealous of the nice weather you're having - its been windy and snowing/raining here. Bleh. Ah well, summer will be here soon and I can't wait! Tanning, no homework, hanging by the lake...it can't get here soon enough! You look lovely and ... young!!! :) Your sandals are amazing! Looooving the sandals, Rory! And yes, time flies by indeed ;) Enjoy your last weeks in High School!! Enjoy every bit of it- and soak it all in!! This is a great look - it so much embodies summer! 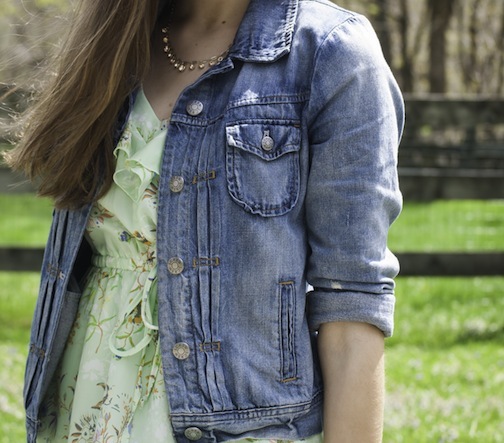 Rory, this look is so pretty and screams summer! That dress is gorgeous! So you can imagine what it feels like then to be in grad school! How did this happen?? I freak out a little when I realize that the youngest undergrads in my school were born in 1995. Whoa. Lol. Good luck on your AP tests and on the SAT! !